The Quebec Farmer’s Association and FGCAQ use these questions to help farm families check out their expectations of one another in the transfer process. You just have to sit down with your copy of the questions and answer yes or no to each question. Then you need to discuss the gaps or differences of opinion with the rest of the farm team. Purpose: It’s a very easy tool to use to define everyone’s perceptions regarding the farm transfer. It helps identify the farm transfer elements that you are prepared for, and then share everyone’s perceptions. Choose your farm advisor resource person and make an appointment. Make copies of the questionnaire for each farm team member. Answer the questionnaire individually, it takes about 30 minutes to do. 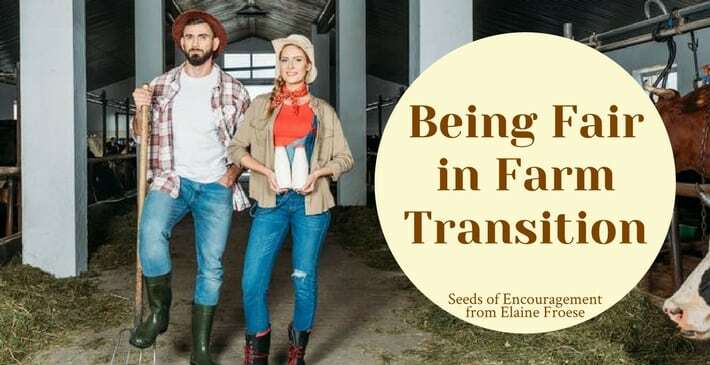 The parents are aware that transferring within the family means a sale price lower than the market value of the farm enterprise, and they accept this. All the potential candidates who could become head of the farm enterprise have been considered and evaluated objectively. Each candidate’s alternative career, interests and expertise were examined. The parents determined who could take over as head of the farm enterprise. The children are aware that the parents do not have to sell to them. The topic of equity with the other children was clearly discussed. The expectations regarding training and the acquisition of experience outside the farm enterprise have been identified and accepted by everyone. The obligation for the children to work on the farm before taking over was discussed. 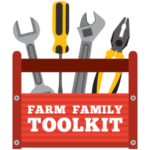 The family and farm enterprise have a back-up plan in case the person identified to take over leaves the farm enterprise or has to be replaced (ex: another child, selling to non-family member). The parents and the children have the same view of the farm enterprise. Everyone can recognize the other’s strong points and suggestions are made politely ( ex: “There are possible savings to be made in feed “vs. “You’re feeding too much.”). The parents and the children are able to express their needs (level of autonomy, decision-making power and responsibilities desired) and discuss the farm transfer in the absence of outsiders. Every family member is able to discuss directly with another member of the family without a third party (ex: father and son discuss directly without the mother acting as a go-between). The participation (or non-participation) of the children’s spouses was discussed and accepted by the family. The parents and the children had a training session on the co-management of the farm enterprise and put in practice what they learned. Meetings where the organization and the management of the farm enterprise are defined are held at least twice a year. Members of the family not involved in the farm transfer are aware of the procedures and can voice their opinions. The advisors are kept informed of anticipated plans. Information received by the farm enterprise (mail, visitors, information meetings) is easily accessible to everyone. The farm enterprise has external advisors and, when needed, these advisors work in a committee with the family. The choices for investment for the farm for the next 5 years are well known. The current assets have been well maintained and will not require major investment in the five years following the transfer of the farm. The efficiency level of the farm enterprise is higher than average. The methods of payment will be sufficient to make the annual payments after the transfer of the farm (Provisional budgets taking into account possible scenarios after the farm transfer). The strategic plan integrates the clearly identified personal objectives (goals) of the parents and the children. Complementary to family objectives, the long-term plan also includes clearly defined economic and financial objectives. (Ex. : financial ratio, expected profits). An evaluation of the technical and financial performance of the farm enterprise is performed annually, and improvement measures are identified and put in place. Employees who are not part of the family, but who play a key role in the farm enterprise, are integrated in the creation of the strategic plan of the farm enterprise. A co-management period, before the transfer is completed, has been defined and accepted. A plan was created to progressively delegate the management responsibilities to the adult children during the co-management period. The conditions for supervision of the adult children have been set. Employees who are not members of the family are also involved in the transition period. The means to assess the performance of the children have been put into place. The terms and conditions of the children’s salaries were previously defined. An evaluation of the pace and the way the transition is being carried out has been put in place. Training and information – The level of training (college, university) and specialization of the children is adequate. The children participate in community activities and read agricultural publications. The children know all the different aspects of managing a farm enterprise, particularly bookkeeping and financial management. The parents and children meet regularly to make decisions about the farm enterprise. Okay, that’s a lot to chew through, but the Chinese say that the journey of 1000 miles begins with one step. Each question requires a simple yes or no answer. After you have answered the questions, compare your responses with the rest of your farm business team. Write out three positive elements and three concerns that result from the discussion. If you have some index cards , use the blank side to write out the key issues in one word on each card…”letting-go” “maintenance” “personal goals” “viability” “power and control” may be some issues that need further discussion. Literally laying the cards on the table helps facilitate the discussion by focussing on one issue at a time. I call these “discuss the undiscussabull” cards. Understand that farm transition is a process, not an event, and things take time. Now it’s the fun part of re-inventing yourself in retirement, and finding out about the plan for the transfer of assets. You may not like paperwork, but as a coach I’ve had clients tell me that writing things down to make them more real was a great benefit from being coached! Here’s the last piece of the 60 question puzzle. Remember to answer each question with a simple yes or no. Preparation of a retirement plan (as opposed to just planning to die in the dirt). The parents have projects for an active and interesting retirement. The parents currently have activities outside the farm enterprise. The parent’s residence after a farm transfer has been chosen. The parents have determined when and how they would like to completely leave the farm enterprise. The necessary funds to ensure their retirement have been assessed. The parents have accumulated enough money outside the farm (RRSP or other investments) for their retirement. The minimum sale price of the farm in order to complete the retirement fund has been assessed. The continuation of participation in farm activities by the parents after retirement was discussed as a couple with the children while avoiding a long-term commitment. The parents are able to associate socially with those other than farmers. The market value of the farm enterprise has been assessed by a competent resource person. The sale price (or calculation method) has been determined. Tax planning, including the choice of legal structure(s), for the farm transfer has been carried out with a team of specialized accountants and tax experts. The parents have decided if they will finance the farm enterprise after their withdrawal, or if they will keep a certain investment in the form of shares or participation. The farm transfer team studied which transfer method would be best while taking into account the professional and personal objectives of those involved. The parents’ wills take into account their desire to transfer the farm enterprise to the identified successors. A clause for the “balance of sale” in cases where the farm enterprise is sold in the 10-20 year period following a farm transfer has been discussed and will be included in the sale contract. Those involved in the farm enterprise are aware of the different assistance programs available. All agreements are in writing and have or will be recorded in legal form. a. Emergency plans have been prepared in the event that the parents’ ability to manage the farm enterprise change (death or disability). b. Life, salary, disability and general insurance for the farm take into account the needs of the children. You now need to sit down and chat about your responses with the rest of your farm family business team. Vincent McConnell, works with CREA in Quebec alongside farm families in transition. He developed these 60 questions, which are printed with his permission..Check out www.farmcentre.com, the website of the Canadian Farm Business Mgt. Council.